Dr. Karen R. Munana, North Carolina State University. Toby’s Foundation sponsors this Morris Animal Foundation (MAF) grant for Dr. Munana. Preliminary data on the first dogs enrolled in the study show the Whistle Activity Monitor has an overall sensitivity of 16 percent at detecting seizures. This low result was expected as the first phase of the study design used a “one-size-fits-all” algorithm for seizure detection. In the next phase of the study, the algorithms will be personalized for each of the dogs, building on the first results, to help increase the sensitivity of the monitors. Over the next several months, researchers will continue to enroll more dogs for a more robust data set. Analysis of the data at the completion of the study will determine the accuracy of the device in detecting seizures. For information on enrolling your dog in this study please click here. 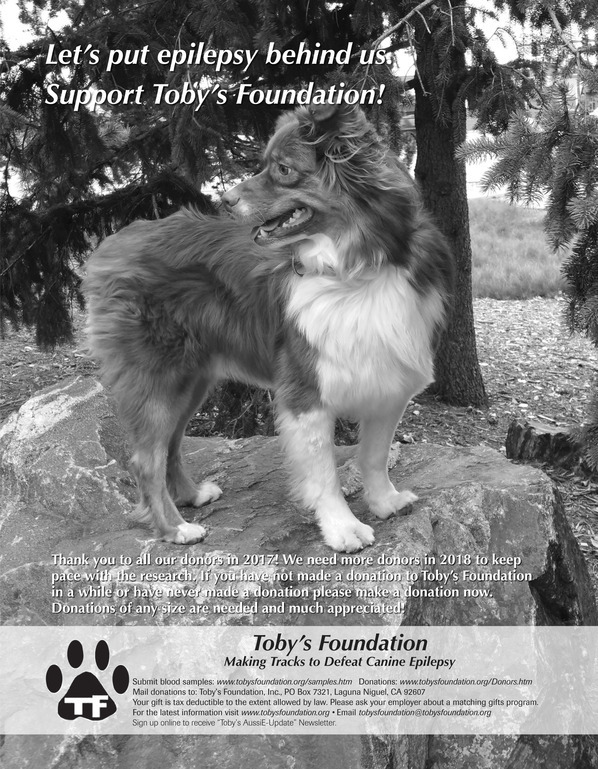 There are reports due in on four other canine epilepsy grants that we sponsor and as always we will share them with you. Thank you for your support! We cannot do this without you!